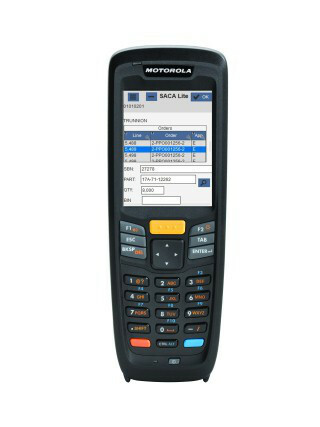 The warehouse management system program SACA Lite a allows simple and methodical management in real time of both, product's locations and order picking by means of the use of on-line radio frequency terminals. With a modern architecture, graphic operator environment, Relational Database, direct control of the RF terminals through a AJAX Web application, integrated thermo-transfer printers for label printing management, etc. This package provides a low entry cost and with a very ease implementation to the world of Warehouse Management Systems, allowing all kinds of companies, even those of small size, benefit from the advantages of an on-line warehouse management system and bar codes. This wms can be linked to the ERP of the company, incorporating a complete real-time control of warehouse locations and guiding operators in the preparation of orders, all through the control provided through online RF terminals linked to the company network through a WiFi network. Almost full disappearance of errors related to shipping different SKUs, by means of the use of bar codes to identify parts and bins in the picking, put-away and inventory procedures. Guided picking procedures using rf terminals. Inventories made using portable rf terminals. Parts receiving made directly on the portable rf terminals. Modern architecture, running on Windows (7,8.1, 0) and SQL Server Express. Direct online management of radio frequency terminals through an AJAX web application on a powerful application server. Subsidized migration program to the advanced WMS Visual SACA Pro.